The Bullet-4 is a dual core balun with a compact enclosure (looks like a bullet) enclosure that is lightweight and easy to transport for your portable loop antenna solution. Halyard hoist at top of balun for convenient attachment point. Input is via SO-239 coax connector and output with side eye bolt output. 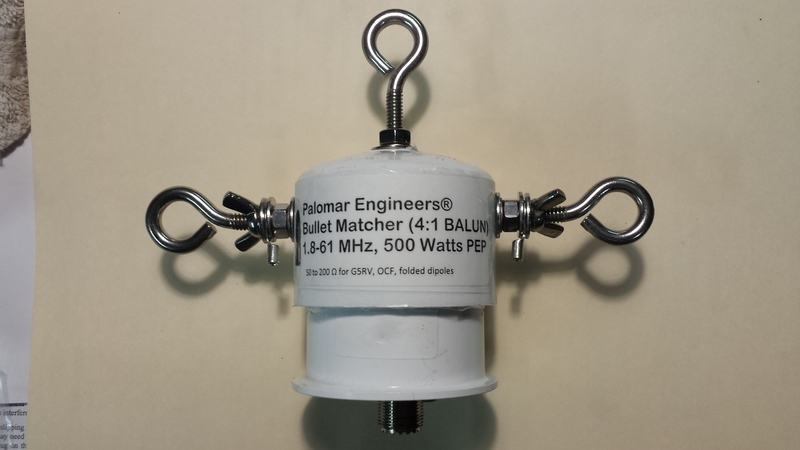 Rated 500 Watts PEP Watts from 1.8-61 MHz. This transformer requires a feed line choke to isolate the coax feed line from the antenna. A coax noise filter at the radio end of the coax is also recommended. Multi-band vertical delta loops can be oriented several way but the most popular is to have the “pointy” end at the top (usually a single support) and the lower horizontal ends just out of reach of humans and animals. Best feed point at the top for multi-band use. Single band vertical delta loops are best fed 1/4 wavelength (246/f(mhz)) from the top point down one side. Vertical delta loops use the same 2:1 baluns as the horizontal loops.